I am wet. Mud streaks my rag-a-muffin shorts. Rain pelts my head and runs down my face in rivulets. Crumbs of brown soil are lodged under my fingernails. And I am completely happy. It’s a three-day weekend and I’ve spent nearly all of it outside. Mabuhay! Live! I’m not out in Chicago’s urban wilds; this time it’s just my postage stamp of a backyard. Still, it’s amazing what you can do even in a teeny space. Ignacio Francisco Alcina, a seventeenth century Spanish friar and chronicler, described the cultivation methods of our ancestors in the Philippines: A row of men would take a heavy digging stick, heavy on top and pointed on the bottom, and pound it into the ground. A row of women would follow, dropping a seed into the holes and then use their toes to cover the seeds with soil. The speed of this sowing, according to anthropologist William Henry Scott, amazed Spanish colonizers for three centuries. I’d bet it amazed our Native Ancestors, too. The act of raising and creating your own food, with the forces and spirits of nature to aid you is quite a cool thing — keeps families fed, boating villages alive, and the datu/chieftain paid his share. And how ’bout this: digging stick + toe planting was organic & green long before Wholefoods (which, okay, *love* it) broke out with its food revolution. So my foremothers wiggled their speedy toes and grew organic camotes (yams), dry rice, and maize (corn). But me? Early twenty-first century Pinay in America, I’m reading The Complete Idiot’s Guide to Vegetable Gardening and Starter Vegetable Gardens: 24 No-Fail Plans for Small Organic Gardens. The desire to grow vegetables came when, last fall, my son discovered a vine growing in our backyard. He checked on it every day. He marveled at the flower. What was it? He was convinced it would grow a pumpkin. It did not. It was an acorn squash. Still, the happenstance magic of that calabasa appearing in our yard compelled my boy more than any of my rants & raves about organics and nature or even taking him to the botanic gardens. We watched the vine grow not knowing what would happen, what would appear. He was captivated. And that’s the mystery of the Cosmos at work, no? Then our local, crotchety facacta neighborhood squirrel (you know who I mean, the one neighbors feed so that now he feels entitled to harass you on your doorstep & throw the evil eye upon you), came and ate the beautiful round, ridged gourd we never asked for and didn’t plan to eat. My boy was pissed. So, this year, we are planting a pumpkin intentionally. And we are asking all the Spirits of Wind and Rain, Sun and Soil, and the nameless Ineffable One for whatever aid they will give. (The more mundane spirit of mojitos helped me yesterday.) Alongside the pumpkin, we pray for chard…carrots…climbing beans…goliath tomatoes…mint from Papa’s garden…basil…green garlic…corn…peppers. Something ought to grow, di ba? 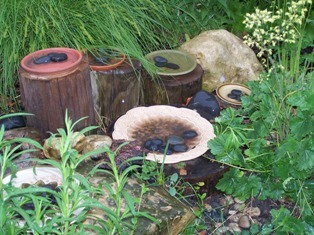 Til then, the nature altar in our backyard stands, replenished with water. The bumble bees, robins, and mourning doves dalaw (visit), and my head is filled with dreams of green things growing and good organic veggies to eat.